(Are you tired of climbing up on that fence yet?) Pretty soon your horse won’t care much about you swinging that rope. Now you’ll give it a toss out there on the ground. Let your rope set there a minute before you coil it up. when horses see that rope snaking back towards them as you coil, some will have a little trouble. So go slow. A few times of this and they’ll be all right. Turn the heat up a little more. 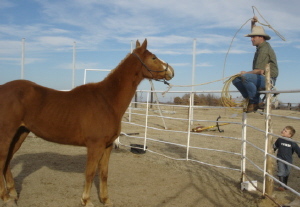 You can take and tie your rope to an old, small fence post or something, and drag it to him and you’ve helped him out a lot. (Go slow, some horses don’t know about stuff being drug towards them.) Essentially when you can do this, you’ve already roped off your horse without even sitting on his back. Make sure you toss your rope in all different directions across his body. 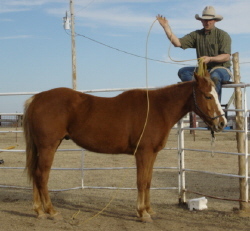 Even if you never plan to use your horse for roping, this will help them out for a lot of things. Always keep track of the slack in your lead rope! If you don’t you can get seriously injured. 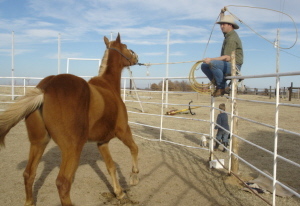 For questions about Roping around your horse from the fence, please contact us.